On the evening of November 12th, the representatives of Hanoi - Amsterdam High School for the Gifted’s Board of Management: PhD. 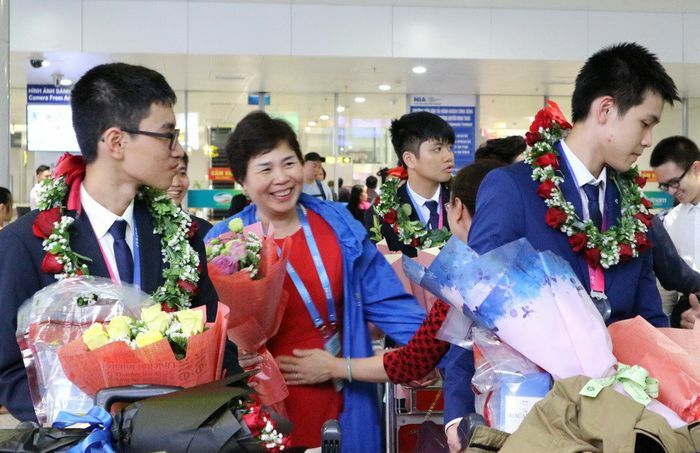 Le Thi Oanh - Party Committee Secretary, Principal; Mrs. Duong Tu Anh - Vice Principal, teachers, parents and many Amsers of the Physics major had gathered to warmly welcome the Vietnamese delegation from the 2018 International Olympiad on Astronomy and Astrophysics (IOAA) with great success: 1 Gold Medal, 1 Silver Medal and 2 Bronze Medals. Mr. Le Ngoc Quang - Vice Director of the Department of Education and Training in Hanoi also came to welcome the team back. By 8 p.m., our bright Amsers had appeared at the airport. They came out with pride and joy to see their relatives, families, teachers and friends at Ams once again. With their effort for the pride of our nation, of Hanoi - Amsterdam High School, they deserved to be rewarded at the upcoming celebration for the Vietnamese delegation. The International Olympiad on Astronomy and Astrophysics (IOAA) 2018 welcomed 38 countries with 46 teams, involving 37 countries with contestants and the Republic of Mali as observers. 313 participants of IOAA this year consisted of 71 teachers, 214 students and 28 observers. 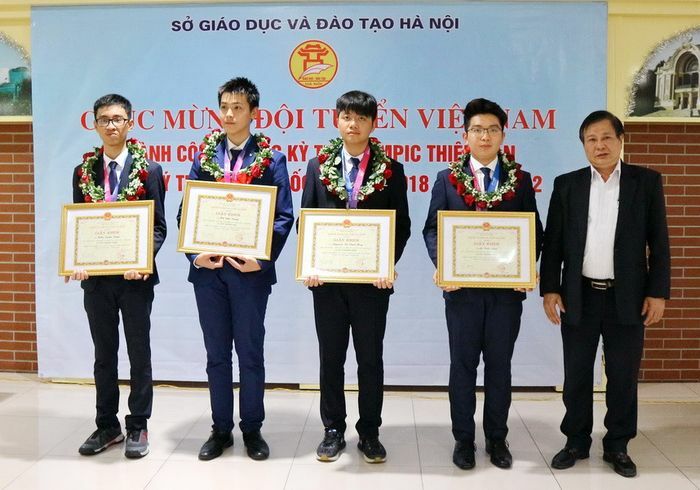 This is the third time Vietnam has participated in IOAA with all five representatives from the Physics major of Hanoi - Amsterdam High School for the Gifted. Guiding the delegation were Mrs. Bui Thi Minh Nga - Head of Delegation, Vice-Head of High School Department, Department of Education and Training in Hanoi , Mr. Bui Van Phuc - Vice Principal of Hanoi - Amsterdam High School for the Gifted as well as the teachers from the Physics department of the school. Contestants at IOAA were obliged to take four tests: Test of Experiments (including 3 parts: Constellation observation, Constellation Mapping and Night observation from telescopes), Test of Theory, Test of Statistic Analysis and Team Test. All the tests were conducted in English. Apart from having the participation of countries flourishing in the field of Astronomy such as Russia, Iran and China, the Olympiad this year got their tests designed by Chinese astronomers, which somehow increase the difficulty compared with the last years. In the end, the students of Hanoi - Amsterdam in the Vietnamese delegation had achieved impressive, “one of a kind” results in three years: Tran Xuan Tung from class 12 Physics 1 of Hanoi - Amsterdam High School for the Gifted won a Gold Medal, Ho Phi Dung from class 11 Physics 1 of Hanoi - Amsterdam High School for the Gifted won a Silver Medal , Le Tran Dao and Nguyen To Vinh Huy from class 12 Physics 1 of Hanoi - Amsterdam High School for the Gifted both won a Bronze Medal. To honor such achievements, Mr. 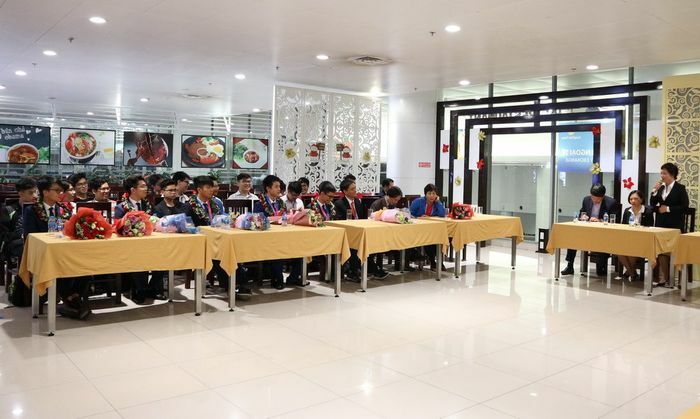 Le Ngoc Quang has given flowers to the teachers and wreaths to the students. Principal Le Thi Oanh has also complimented on the efforts of both students and teachers in the Vietnamese delegation at IOAA 2018. PhD. Dr. Le Thi Oanh stated: Words cannot describe how delighted we all are. We, a country with not much of a foundation in Astronomy, have won the dream gold medal. Despite having to tackle a subject outside of the curriculum with such little time, our teachers from the Physics department have managed to lead our delegation to success. Mr. Le Manh Cuong, especially, have carefully observed the behavior, enthusiasm and skills of each student and encourage them to take part in this year’s IOAA. I strongly believe that all the students participating this year shall have a bright future ahead, for in front of us here is a very talented generation. 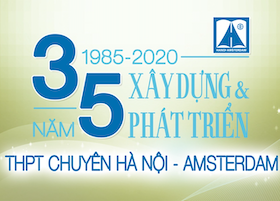 The outstanding achievements of Hanoi - Amsterdam High School this year was the results of the attention and encouragement from the Department of Training and Education, The Board of School Management and the teachers from the Physics Department. Continuing the tradition, Mr. 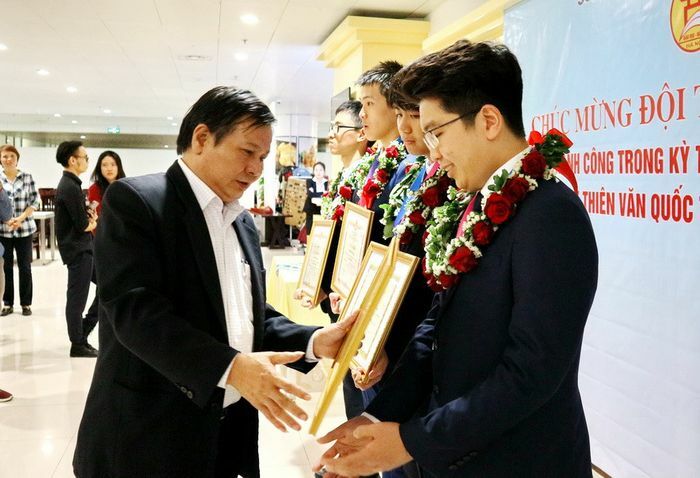 Le Manh Cuong, along with eminent professors, had efficiently provided the 5 students of Vietnam with knowledge in the field of Astronomy for the competition. The harsh weather condition in China (with the temperature dropping to 2 degrees Celsius in 10 days) also proved the commitment of the delegation of Vietnam at IOAA 2018. Finally, the teachers’ effort to protect the rights of our contestants was also worth the compliment. When Tran Xuan Tung’s creative approach to the test wasn’t taken credit, it was the teachers of the delegation who stood up and discuss with the judging panel in order to recognize and reward the exceptional solution of Tung. The outstanding achievement of the Vietnamese delegation at the 12th IOAA has contributed to the excellent performance of Vietnam in the international Olympic Games, marking the development of research in the field of astronomy and astrophysics of the nation, opening a new path, promoting the passion of research and study of students in the field in the future. This achievement is also an invaluable gift from Amsers to the school and its teachers on the occasion of the Vietnamese Teacher’s Day on November 20th. Once again, on behalf of the School Website Editors, we would like to send congratulations to the members of the team. Thank you to the teachers and parents who have been devoting their time and effort to nurture and inspire Amsers so that they can confidently flaunt their talents.